I've officially entered into the Sonray Share Trading Game, it's looks like a whole lot of fun. Its an Australian fantasy share trading game. I'm not sure how well I'll do, I'm betting a lot on Telstra; they've gone so low all they can do is go up… I hope :D.
Prizes Weekly prizes will be awarded to the trader who achieves the greatest percentage gain each week, and the highest percentage gain for the first month will also be rewarded. 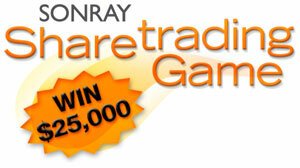 Win the grand prize of a $25,000 trading account with Sonray Capital Markets. Simply fill in the below application, download the SonrayTrader2 and get familiar with it before the game commences!